Eean Cochran will return to Abilene Sept. 21 to perform a one-man show, "Your Shot with Eean Cochran," for the annual Lights Up! event to raise funds for the Department of Theatre. Eean Cochran took five years to graduate from Abilene Christian University – and for good reason. He was getting an incredible head start on his musical theatre career. 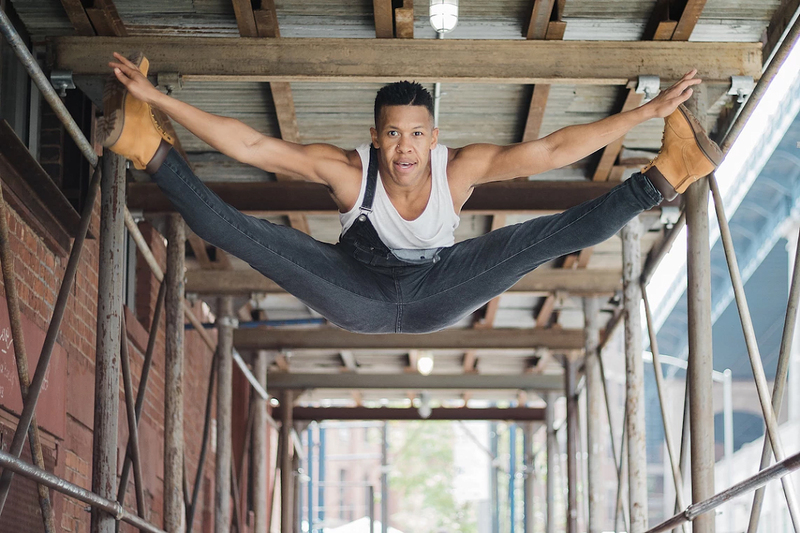 During his sophomore and junior years, Cochran was cast in Broadway tours of Dreamgirls and Bring It On, and had to juggle his coursework around his time on stage. But the extra year it took to complete college was well worth the experience. After graduating in 2015 with a Bachelor of Fine Arts in musical theatre, he joined the Mamma Mia tour for the rest of the summer, then moved to New York City where he added to his credits roles in A Bronx Tale premiere, The Wiz at the Oregon Shakespeare Festival, Disney’s Freaky Friday: The Musical and Newsies. Eean Cochran in his costume for "Hamilton"
Now, only three years out of college, he has landed his dream show: the national Broadway tour of Hamilton. Cochran serves as a swing in Lin-Manuel Miranda’s blockbuster hip-hop musical about the Founding Fathers. As a swing performer, he has learned dances for six different roles to cover when the other actors are unable to perform. While at Abilene Christian, Cochran was founder of the Sanctify hip-hop group, participated in Sing Song as a dancer and choreographer, performed in numerous theatre productions, and was one of the few students in ACU theatre history to be invited to choreograph the homecoming musical, Big Fish in 2014. Cochran is grateful for his experiences in Abilene. “I appreciate ACU, its theatre department and faculty for an excellent education and their constant support,” he said. What can the audience expect to experience at your Lights Up! cabaret? Music, song and dance are powerful gifts that can not only entertain but elevate the mood of an audience. I want the audience to have fun and share in a few of my experiences while attending ACU and performing on tour. What first sparked your interest in music and theatre? How old were you? I was quite the performer as a child. I enjoyed watching my grandfather and uncles perform. My grandfather was pastor of a Baptist church in Memphis where he sang. And my dad and his brothers sang at church and did quartet-style singing at different family gatherings. My interest in musical theatre began around fourth grade when I was in a school performance of Giddyup, Giddalong Gideon. After doing my first musical, I was instantly in love with being on stage. I was involved in more musicals at school, and my high school theatre director, Scott Werntz, helped me realize how I came to life while dancing and singing. What brought you to ACU? I had heard great things about ACU’s theatre department while attending Faith Christian School. A few representatives of the musical theatre department visited my high school at a time when I was singing “Dancing Through Life” from the musical Wicked. Afterward, they invited me to tour and audition for the school, and I loved it. How did the opportunity come along for a role in Hamilton? I think it was a combination of consistently showing up prepared and having faith. It took a few years of going in for the show and trusting myself more and more with the vast material it involves. After working with Hamilton choreographer Stephanie Klemons in Bring It On, I knew I wanted to be involved in this production. After two years of auditioning in between other contracts, I was called in the weekend before leaving NYC to go to Chicago for Newsies. I was brought in with about 20 guys. We learned six different dances and performed them throughout the day. At the end of the day, there were four of us left. They wanted us to come back the next week, but I would be in Newsies rehearsals by then, so Stephanie decided to have me come in the next day with her and learn and audition more. That next Tuesday, while I heading to rehearsal for Newsies, the call came offering me the role. What’s your favorite aspect of working in theatre? Least favorite? I love the connections and relationships that result from the musical theatre community. I enjoy engaging and entertaining the audience as well as finding ways to connect to my character. My least favorite aspect is being away from my family. Has anything surprised you about working in professional musical theatre? I have been surprised at the physical demands and athleticism required at times. What did you learn during your time in ACU’s Department of Theatre that has stayed with you? I learned to trust God, myself and the process. What was the best lesson you’ve learned since graduation? I learned the importance of taking time for self-reflection and rest. These are essential elements to maintaining my focus. I also understand the value of goal setting and discipline. More opportunities for me to grow and develop as a performer. I welcome a greater understanding of my purpose and the power to inspire and impact the world. How do you live out your faith as an actor in NYC? What kind of challenges do you face in that regard? Living my faith as a performer is about being an example and role model. As a performer, you have to learn how to deal with rejection and remain encouraged and optimistic. My family and friends are a great source of support for me.